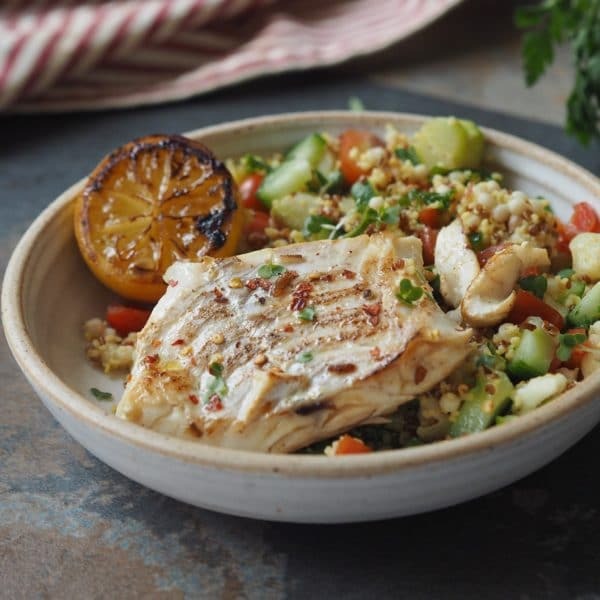 Try this absolutely scrumptious Pan Seared Fish with Tabbouleh today! for 5 min or until all the water is absorbed. Uncover, then fluff up the grains with a fork. Spray a large non-stick frying pan with oil, then set it over a medium-high heat. Sprinkle the fish with the thyme, salt and pepper, then add to the hot pan and cook for 2–3 min on each side until cooked through (it should flake easily). Serve the fish with the tabbouleh, garnished with the lemon zest, parsley and black pepper.